Why Bringing A Glass Of Mosquitoes To The World Bank Is A Good Idea : Goats and Soda Dennis Whittle wants to change the way people come up with ideas for aid projects. His latest venture was inspired by feedback loops for cellphones. Dennis Whittle takes a tour of development projects in Myanmar. Dennis Whittle has worked hard all his life — from teenage days delivering newspapers and scraping paint off wooden bleachers to three decades in international aid and development. 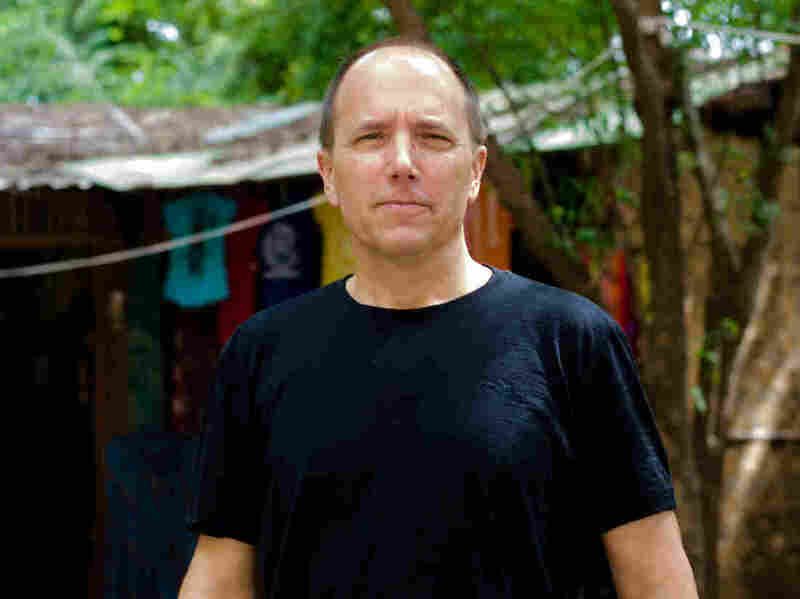 In the nonprofit world, he was initially struck by all the good intentions but discovered that aid groups don't always listen to the people they aim to serve. Whittle, born in 1961, spoke with Tiny Spark about his journey from the World Bank, where he was a lead economist from 1986 to 2000, to his latest initiative that began in fall 2013, Feedback Labs. You spent 15 years or so at the World Bank. What surprised you most there? There are many amazing people at the World Bank. But it's so amazing how, when you get inside one of these systems that's a world unto itself, that you begin to accept ways of thinking that from the outside look a little bit crazy. It took me many years before I had the courage to stand up in a meeting and say, "Wait, that's not the way the world is." And when I started doing that, it really changed my life and changed my career. I've constantly been surprised, both by the failure of people to speak up and also pleasantly surprised by the willingness of people to listen when you do speak up. You helped start the World Bank's Innovation Marketplace in 1998. What was that? My colleagues and I thought to ourselves, what if we had an event where we invited anyone inside the World Bank to pitch an idea to fight poverty? We sent this email around and we got a resounding nothing in response. The idea that people would come down into a public space and pitch their crazy ideas was a little bit out of the ordinary. But the night before the applications were due, we got 110 applications! And then we invited them into the World Bank's Atrium. And there was an enormous cross section of people, ranging from administrative assistants all the way up to the most senior people. And for one day — it still gives me the chills — all that mattered was the quality of your ideas and not who you were. We put a few million dollars on the line, and within a very short period we announced that we would be supporting 11 ideas with four or five million dollars of startup capital. At the end of that event, several senior World Bank people came up to us and said, "We've had specific ideas for years, but we've never been able to get those ideas heard." These people are in their 50s had been in the Bank for 20 years in some cases. We started thinking, "If it's hard for a senior World Bank economist to have his voice heard, what must it be like for everybody else in the world?" Did anything stand out from the marketplace? I recall a senior official who had been trying without success to raise awareness about the human cost of malaria. At the Innovation Marketplace, he brought a big plexiglass cube full of mosquitoes into the atrium. When he finished making his argument to the judges, he then put his hand on the lid of the cube and said something like, "And if you don't fund my malaria rollback idea, I will take the top off this cube and let all these mosquitoes out!" The judge leapt back instinctively because they suddenly saw the issue from a human and not solely analytical perspective. You and your wife Mari Kuraishi later resigned from the Bank and launched Global Giving in 2002, which enabled people to post on its website projects aimed at improving the world, and any individual could fund them directly. You report that $200 million has gone to 14,000 projects in the past few years. Yes, as impressive as those numbers are, the thing that I'm proudest of is conveying this idea of possibility and opportunity. We still get emails from people saying, "Using Global Giving was the first time in the world anyone ever listened to me and took me seriously." That's really powerful. You were CEO of Global Giving for its first decade. A few years ago, you got the idea for Feedback Labs when just looking at your phone? Yes, I realized in the marketplace for things like cellphones, there are intense feedback loops from customers, and companies launch all sorts of products to see if they please customers. So I wrote this essay about my life at the bank, and how little feedback from our customers we ever got; how insulated we were. And I asked what would happen if we could get much faster feedback loops from the people we were trying to serve? A bunch of people contacted me and said, "We're working on this." So I went home one night and bought the website FeedbackLabs.org. And what is Feedback Labs? Feedback Labs is a network of about 15 or 20 organizations trying to figure out a way to put people first for aid and development. Ten years from now, we hope to see foundations, aid agencies and ultimately governments spending their days structuring their meetings around three questions: What do regular people want to make their lives better? Are we as an aid agency, a foundation, or even a government helping them achieve those things? If not, what should we do differently? This interview, which has been edited for length and clarity, was produced by the podcast Tiny Spark, which is hosted by Amy Costello. Tiny Spark is made possible by a grant from the William and Flora Hewlett Foundation.